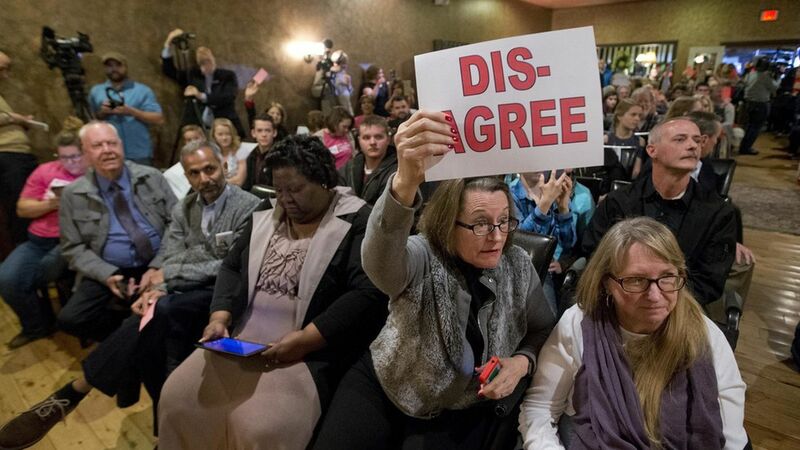 Town halls across the country last night erupted as U.S. citizens expressed their opinions and discontent with the political scene and demanded answers from their Congressman. Here are videos of recent hot moments. At Dave Brat's town hall, the crowd laughed after one member asked if Brat thought everything was running smoothly, as Trump has claimed. At a town hall with Mitch McConnell, a woman demanded to be answered about what would happen with Obamacare. Chuck Grassley's town hall attendees complained that they wouldn't be able to afford health insurance without Obamacare. Tom Reed got booed late last week when he told the crowd Obamacare would be repealed. In Iowa, the crowd started chanting "Do your job!" at Joni Ernst when the town hall came to an abrupt end. And protesters let an absent Darrell Issa have it. Background reading: Why Republicans should be nervous about repeal, and inside the new effort from a McConnell-linked group to push back on conservative hardliners.